A writer writes a very first picture book. Against all odds it is accepted by a major Canadian publisher. It immediately gets shortlisted for a book prize. Who is this author? 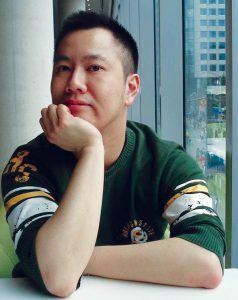 Alan Woo was born in England but grew up and lives in Vancouver, BC. He wrote Maggie’s Chopsticks. This, his first book, was just awarded the Christie Harris award as best BC illustrated book. I asked him some questions. Margriet: How long have you been a writer? Is writing your main profession or do you have another job to “support your habit”? Alan: I’ve always loved writing, ever since I was a kid and wrote stories in school for class. I wanted to be a writer and have set the foundations for doing so along the way. I wrote for school papers, did a minor in Creative Writing at the University of British Columbia and a major in English. I freelanced for publications around town, around Canada, and even some American publications, including Quills Canadian Poetry Magazine. I’ve written non-fiction, plays and poetry. I never dreamt I would ever have a children’s book to my name! As much as I would love to have writing be my main profession, I work a day job doing I.T. and tech support for computers. Margriet: Maggie’s Chopsticks is the gentle story of a little girl who wants to learn how to eat with chopsticks but can’t seem to master the skill, despite advice from various family members. She doesn’t give up and learns more along the way than just eating in a different way. What inspired you to write this story? 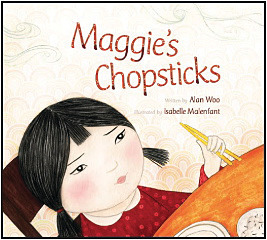 Alan: Maggie’s Chopsticks began as a poem I had written during my university days, back in the late 90s, inspired by my own Chinese-Canadian heritage. It was a poem called Chopsticks and dealt with issues of identity. A prof of mine liked it so much that she even taught it in some of her classes! I was then approached to submit a “bedtime story” for a contest that a magazine I freelanced for was holding. I took the poem and turned it into a children’s story, introducing the character of Maggie. The contest didn’t go anywhere, so I now had this story on my hands and I thought that I should try to shop it around. I sent it out to a number of publishers in Canada and got quite a few rejection letters back, which I was used to at this point. Then Kids Can Press came calling and they said they liked my story and wanted to work with me on it. It took about a year of edits, and then another year for the illustrator to do her work. It’s my first published book ever! Margriet: Is this really a story of chopsticks or is it metaphorical for other skills in life? Alan: It’s absolutely a metaphor! One of my friends read the story to her son who is in Grade 1, and at the end of it, he said to his mother, “That is a good book. We are all different and it’s okay.” I could not have been happier to hear that! He totally hit it on the head! If my book can reach any kid out there who feels different or that they don’t really fit in, and lets them know that it’s okay to be who they are and to just be their best self, then nothing would make me prouder to have written it. Margriet: Do you have children of your own? 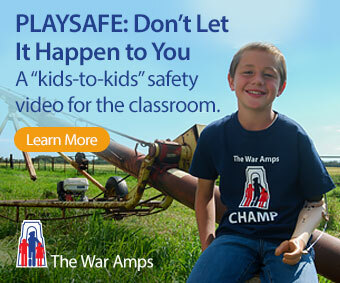 Did they, or others, or students, help you to tell this story? Alan: No, I do not. I think what helped me tell this story is my own experience of feeling like an outcast and not knowing until I was an adult that being an individual was perfectly fine, in fact more than fine. I probably spent too much time trying to fit into categories and boxes that other people wanted to put me into, but at the end of the day, I embraced who I was as an individual and learned to love myself, and I hope the book helps kids out there to do the same. Margriet: Were you involved in the illustrating process? Are you pleased with the final result? Alan: I had no real say in the illustrations. I definitely was worried about what might happen and what kind of illustrations I would have to live with, but illustrator Isabelle Malenfant did a beautiful job. I fell in love immediately with her artwork and couldn’t be happier about it! I am so proud of the book, and the illustrations definitely help. They are rich, layered and thoughtful. My favourite part (added by the illustrator) is the cat who shows up on every other page. Margriet: Do you do school readings? If so, what do you do during a presentation? Alan: I haven’t done many readings yet but will be going on tour with BC Book Prizes and doing at least a school a day for that. My old elementary school wants me to visit and do a reading there too, so I’ll do that as well. Margriet: Are you part of a writers’ support group? Alan: I have a few friends who are writers and they’ve given me great tips and advice. I know I can always count on them. I have one friend with whom I meet somewhat regularly to trade work and basically be one another’s deadline and inspiration. Margriet: What are you reading right now? Alan: I just finished reading Patti Smith’s autobiography Just Kids and have picked up The Book of Negroes and Shantaram, both of which everyone around me tells me that I simply HAVE to read. I also finished my friend Billeh Nickerson’s book of poems Impact: The Titanic Poems and am looking forward to my friend Amber Dawn’s new book, How Poetry Saved My Life.